If you can engineer in the Arctic, you can engineer anywhere. Have you ever thought about building a road in an area with thawing permafrost? How about transporting water to and from a treatment facility under extreme weather conditions? These are just a few of the trials that engineers face working in the Arctic, and a big part of what makes the Arctic Semester such an invaluable opportunity. Since arriving in Sisimiut, Greenland, we have been presented with extreme and harsh environmental conditions and the challenges engineers must work to overcome. The integrative learning experience pairs university style lectures with hands-on field experience with an emphasis on discussion and peer-to-peer learning. Course content includes classes that focus on Environmental Engineering in the Arctic and sustainable development. Although classes are taught in English, we are still faced with a language barrier within the community. Greenlandic and Danish, the primary spoken languages, happen to be extremely complicated to learn! So far, we’ve learned ‘thank-you” in both languages –“qujanak” and “tak.” This exchange has been an academic learning opportunity as well as a cultural one. 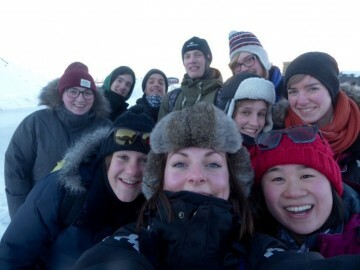 We have immersed ourselves in the community, with activities such as helping to build the local skating rink on the lake and volunteering with the Arctic Circle Race. A valuable aspect to the program has been the diversity amongst the students. With three Canadians, three French, one Swiss, one Norwegian, one Icelander, one Slovakian and one Greenlander – new perspectives and ideas are brought to the table! Diversity is essential to engineering in all facets and we are truly grateful to have made lifelong friends and colleagues within our field of study. 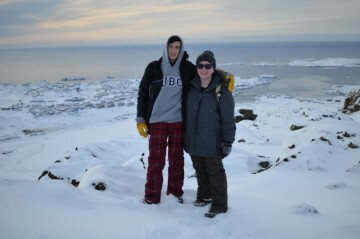 If given the opportunity to study abroad during your environmental engineering studies we highly recommend you do so! We have gained valuable knowledge and experience that applies directly to our future careers and hope to share this knowledge with our fellow students when we return to UBC in the fall. Feel free to contact us if you have any questions regarding our exchange and how you can take part in the Arctic Semester. You may be wondering, is it cold there? Yes, it is very cold. So you can imagine how upset I was when my jacket zipper broke within the first week of arriving… I quickly went to every store in town, all three of them, to find a needle and some thread. I now have a pullover winter jacket, but at least it protects me from the cold! There is a “Hakuna Matata” mentality, or as they say in Greenlandic, “ajungilak.” So I decided to take up cross country skiing. Without ever trying it before, I went to the store and rented a pair of skis without a contract or specified return date (I’ll bring them back when the snow melts). Whilst Laura and I are improving, during our first outing I fell 7 times within the first 15 minutes… and kept looking over my shoulder to see Laura, having fallen about 15, once per minute? Impressive.